The planned amalgamation of Cairns and Port Douglas councils should be seen as an opportunity for Cairns to learn from its northern neighbour rather than as a takeover, Cairns Mayoral aspirant, Val Schier believes. “Port Douglas residents are fearful of the proposed merger, and understandably so,” Ms Schier said. “They fear a loss of identity and are afraid that Cairns councillors will dominate the new council’s decision-making and allow open slather on developments,” she said. “The recent troubles within their council should not hide the admirable work that has been achieved in the Douglas Shire over the past two decades. They have an enviable record of having created a vibrant economy whilst being acknowledged nation-wide for their environmental credentials.” Ms Schier said. The 300 hundred people who attended an informal meeting outside the council chambers at Mossman on Saturday morning unanimously rejected the proposed amalgamation and explored numerous ways of getting their voices heard. “Whilst Peter Beattie has said that he is adopting the shire boundary recommendations ‘lock, stock and barrel,’ it is important for democracy and for the spirit of the community that they make every effort possible to get the state government to change its mind,” Ms Schier said. If the residents’ protests are not acknowledged and the merger goes ahead, then it will be a challenge for Port Douglas – with only 6,200 voters - to have representation in a new “undivided” council where the commission has recommended the abolition of divisional representation. 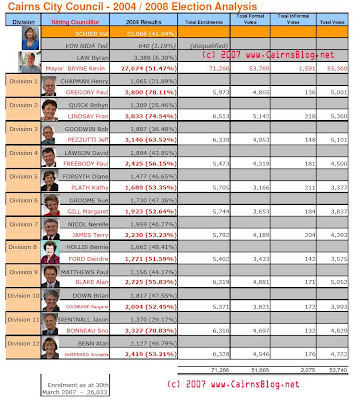 The more than 72 000 Cairns voters would swamp the Douglas shire voters. As a Mayoral candidate, Ms Schier says she will work collaboratively with Douglas Shire residents whether the amalgamation proceeds or whether the residents win their challenge. Would you like to join the Supporters Mailing List for the Cairns First Campaign? Click here to subscribe to the list. Premier Peter Beattie has welcomed an independent report which recommends significant reform to the system of local government in Queensland. The Premier and Minister for Local Government took delivery of the report from Local Government Reform Commission Chair Bob Longland this morning. Mr Beattie said the two volume 455-page report recommends boundary changes and amalgamations which reduce the number of Councils in the State from 156 to 72. • Reducing existing councils from 156 to 72. • Reducing the number of Mayors or Chairpersons from 156 to 72. • Reducing the number of Councillors from 1094 to 454. • This is a total reduction of 724 politicians. • Creating a new class of councils – regional councils - representing key economic development hubs of the State. • For the 2008 elections all councils subject to the review, apart from the Torres Strait Island Regional Council and the Northern Peninsula Area Regional Council, should conduct their election on an undivided basis. • New names for amalgamated Councils are based on relevant local geographical features or nomenclature. However it is important to note that where two or more Councils have been amalgamated and these Councils share concerns regarding the adopted name we will accept a unanimous submission from the councils for a different name. Mr Beattie said State Cabinet had considered the report this morning and had agreed the recommendations on boundaries would be adopted ‘lock, stock and barrel’. He said other recommendations such as elections on an undivided basis would need to be considered in more detail over the next few days. • Improving the capacity to develop a coherent regional plan for the management of growth in an environmentally sensitive coastal region of Queensland comprising high tourism values. - undertaking core corporate activities including executive and administrative functions, finance, and information technology. • Increasing capacity of the new local government through a larger revenue and asset base will enhance its prospects of attracting, developing and retaining the skills base required to undertake planning and actively manage the anticipated economic development in a manner that will maintain and protect the high value environmental attributes of the region while delivering quality social outcomes. • Strengthen the ability of the new local government to engage with industry and State and Federal Governments in relation to tourism, environmental issues, economic development, airport and seaport development, road networks and water, waste and sewerage issues on a regional basis. 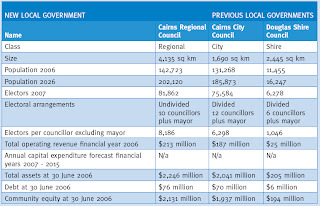 • The amalgamation of Cairns City and Douglas Shire Councils is likely to improve the quality of governance to ratepayers of Douglas Shire which has been of significant concern in recent years. • Cairns is the regional centre for far north Queensland where all major educational, health, commercial, government, retail and financial services can be accessed. • The region is heavily dependent on tourism which is to a large extent linked to the Great Barrier Reef and the Wet Tropics World Heritage Area (i.e. Kuranda Rainforest and Daintree Rainforest). Accommodation caters for the complete spectrum of tourists with the high-end tourists favouring Port Douglas, Palm Cove, Daintree Rainforest accommodation, some of the islands and hotels in Cairns. There is also plenty of budget accommodation across the region catering to backpackers. • Cairns airport services both domestic and international flights which are essential for tourism in the region. This airport is owned and operated by Cairns Port Authority. • Cairns also has a seaport which is used to import petrol and export raw sugar amongst other cargoes but its most significant purpose is to take tourists to the Great Barrier Reef and hosts cruise ships. • Strong transportation linkages between Douglas Shire and Cairns City supporting both tourism and commerce along the coast. Cairns City Council is not rated in the Financial Sustainability Review by Queensland Treasury Corporation. Based on historical data (as forecast data is not available) it is QTC’s view that Cairns City Council be rated as either moderate or strong. Douglas Shire Council is also not rated in the Financial Sustainability Review by Queensland Treasury Corporation. Based on historical data (as forecast data is not available) it is QTC’s view is that Douglas Shire Council be rated moderate. There are issues around the relationship between the councillors and administration of Douglas Shire Council with the Chief Executive Officer recently being dismissed. An amalgamated council should result in stronger governance. • undertake regional planning and infrastructure delivery. The Commission did not identify any specific issues relating to the formation of the new local government area. No major issues were identified. The Commission notes the boundary issues raised by Cairns City Council regarding Kuranda and the Johnstone and Mulgrave Rivers may warrant further consideration at a later date should the adjoining councils wish to seek review under the Local Government Act 1993.
he Commission gave consideration to the 81 suggestions it received in relation to the Cairns/Douglas area. 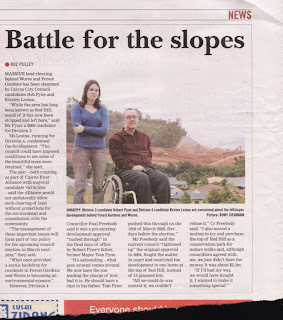 • Douglas Shire Council opposes amalgamation and wholesale boundary realignment with the preferred option being to complete minor boundary adjustments between Douglas Shire, Cook Shire and Wujal Aboriginal Councils; and consult with the communities living north of the Daintree River to determine the extent of support for realignment within another shire’s boundaries. Council also explains why other possible options are opposed. - community wealth accumulated and paid for by the Douglas Shire community would be transferred as subsidies and service improvements to the other communities. - the most vociferously opposed option by Douglas Shire Council as there are real threats to the community’s social and cultural fabric, its identity and brand value as an international tourist destination, its iconic environmental status and the lifestyle preferences of its residents. - success would be dependent on reform and alignment of State and Federal Government services. - complexity of implementation would be significant. • Cairns City Council’s preferred option is to retain the status quo on the basis that the community has already been through amalgamation in 1995 and little has occurred since then to challenge this rationale. - opportunity for Cairns City Council’s capacity and expertise to be applied more broadly to Douglas Shire’s infrastructure requirements. 4. Boundary change – Kuranda and district to Cairns. 5. Amalgamate Cairns City and Yarrabah Aboriginal Councils. 6. Boundary change – area north of the Johnstone River to Cairns. 7. Amalgamate Cairns City and Johnstone Shire. 8. Boundary change – area south of the Mulgrave River to Johnstone Shire. 9. Amalgamate Cairns City, Douglas Shire, Johnstone Shire, Cardwell Shire and Yarrabah Aboriginal Councils. - there may be more merit in establishing an amalgamated Regional Council to manage the range of community matters specific to communities. - Any amalgamation should not be to the financial detriment of Cairns. - relation to electoral arrangements, Cairns City Council suggests that if council is amalgamated, single member electoral divisions should continue. The name should remain Cairns City Council. - a review of the methodology for calculating financial assistance grants for local government authorities. • Amalgamation with the nearby Aboriginal local governments is not recommended because of the different land tenure and rating arrangements that exist, that need to be resolved before amalgamation with mainstream local governments can be contemplated. 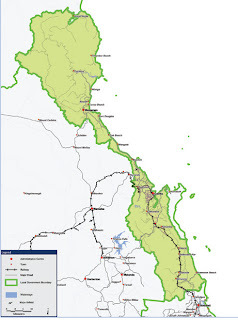 • ‘wet tropics local government’ incorporating all shires north of Townsville City and Dalrymple Shire is considered too large, administratively complex and lacking a common community of interest (other than the wet tropics itself). • The vast area of both the ‘wet tropics local government’ and ‘far north Queensland local government’ is similarly considered too large and lacking a common community of interest (other than far north Queensland itself). • A ‘far north Queensland local government’ incorporating Johnstone Shire and Cardwell Shire Councils as well as the Tablelands Shires and the Aboriginal local governments is also considered too large, administratively complex and lacking a common community of interest. • An amalgamation of Cairns City, Douglas Shire, Cardwell Shire, Johnstone Shire and Yarrabah Councils is also considered too large, administratively complex and lacks a sufficient community of interest. • amalgamation of Cairns City and Johnstone Shire Councils is an amalgamation of like communities of interest and is also helpful to Johnstone Shire Council in financial and resourcing terms. However, the Commission considers the communities of interest between Johnstone Shire and Cardwell Shire to be more cohesive and distance considerations precludes Cardwell Shire being amalgamated with Douglas Shire and Cairns City Councils. The community of interest seems more cohesive between Johnstone Shire and Cardwell Shire. • In line with the Commission’s Terms of Reference the boundary changes raised were not deemed to be of such a major nature as to warrant splitting existing local government areas. 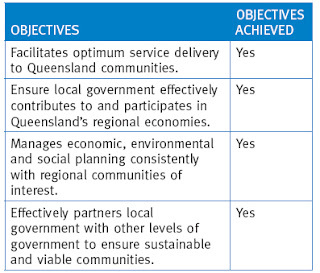 • The Commission agrees with the positive outcomes outlined by Cairns City Council arising from an amalgamation with Douglas Shire Council and concludes these outweighed the negative outcomes. In addition, it believes that most of the potential negative outcomes do not have to be debilitating if addressed proactively by the amalgamated local government. An amalgamated local government will have the capacity to ensure planning for and the management of development in Port Douglas recognises and protects its attributes and character. There were no other considerations. CairnsPlan is the Planning Scheme for the City of Cairns. CairnsPlan has been prepared in accordance with the Integrated Planning Act 1997. CairnsPlan sets out Council’s planning intentions for the City for the next 10-15 years. Click on the relevant Chapter to view the text and maps in Adobe Acrobat format. It's good that the Cairns City Council has launched Cairns Style guide (20/04/07) with its advice to use louvres, wide eaves, fans, balconies and foliage to block off the sun. However, residents can't help but ask how come it's taken so long for Council to discover what the early residents of Cairns knew more than 100 years ago. The early builders did not build the sorts of houses that were suitable for the southern cities of Sydney, Melbourne and Hobart; buildings that were designed to keep the warmth in. They invented the Queenslander with all of the wonderful features that made living in the tropics easier. We need to respect and admire what is left of the heritage of Cairns, learn from it and not be hell bent on creating a city where old Queenslanders are bulldozed and replaced with concrete boxes. To view the Cairns Style please click on the links to the Chapters below. The file sizes are large due to the nature of the document. Copies of the Cairns Style Design Guide are available from the Council Customer Service Centre. It's good to see that Cairns Water is putting into place a campaign to make people more water conscious and encourage them to reduce their daily water usage. However, setting the reduction at only 10% is not a very big ask. We currently use more than 500 litres per person per day - huge in comparison with most other cities and towns in Queensland - and most people think that we can go beyond the 10%. If we reduce demand for water significantly then we can delay the time when we have to outlay huge expenditure for new water infrastructure. Meanwhile, we also have to ask what is happening to educate tourists to reduce their water usage and what resort developers are doing to help. All those inefficient shower heads and single flush toilets are wasting water and pushing up the daily average. 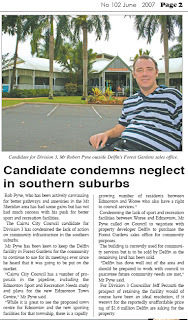 It is with dismay and a sense of despair I have just read two seperate articles in the Cairns Post (Monday 19th) . The first has a developer wanting to bulldoze through his "dream" of a muti million dollar resort at Buchan's Point, despite the project being quashed by the State Government last year. And who rises to support this, but a once vigilant independent member of Council, Sno Bonneau, giving the weak excuse that "Council had no choice but to approve the new request!" Then, relegated to "In Brief", I see that a surge of more than 900 applications by developers have been submitted to Council for approval since December!. It seems to me the people of Cairns deserve much, much better from Council members . We need less tired and ground down independents who are not afraid to rigourously and intelligently debate development applications, rather than saying there is no choice. 2008 can't come quick enough! How disappointing that there is not one event in Cairns during the Queensland Music Festival that runs from 13 to 29 July. Residents of Mackay, Mt Isa, Townsville, Innisfail, Longreach and Cooktown will all get a chance to see and hear an array of musical events in what is billed as a "festival of the people," but not Cairns. 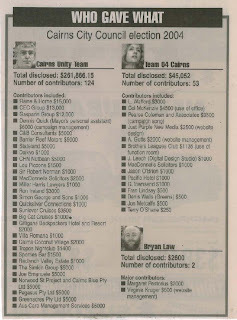 It seems that Cairns City Council has not expressed an interest in partnering with the Queensland and Federal governments to showcase our many talented musicians, artists and designers. Is this because the Council is so focussed on Festival Cairns? We've missed out this year but let's stop trying to cram too many events into September and get on board with this wonderful musical celebration in 2008. Please note meeting times and dates may change. Please check prior to meeting. BETTER planning for bicycle ways and footpaths is a major issue for disability advocate Robert Pyne who has joined mayoral aspirant Val Schier’s team. “At the moment we have children walking and cycling along the cane train line to go to school in Anderson Road,” Mr Pyne said. He said a comprehensive review needs to be undertaken to ensure a fully integrated system of bikeways and footpaths. “Not only will it be safer, but more cyclists will take the pressure off the road system especially at peak times before and after school when parents are driving to drop off and pick up children,” Mr Pyne said. Ms Schier, in announcing that Mr Pyne has joined her growing group of candidates to contest the 15 March 2008 Cairns City Council elections, said Mr Pyne would contest Division 3 which covered the Forest Gardens, White Rock, Mt Sheridan and Woree areas. “Rob will really strengthen our diverse group of council candidates,” Ms Schier said. 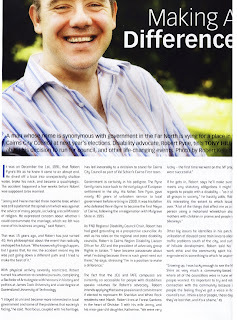 Mr Pyne is already well known for his advocacy for people with disabilities. He works at James Cook University attracting and encouraging people with disabilities to succeed at university. Robert is a fourth-generation Cairns resident. He was born in Gordonvale and lives at Forest Gardens with wife Jenny and daughter Katie. Nearly four decades of living on the south side of Cairns has given him a good knowledge of the concerns of people in that area. Ms Schier will continue to recruit high calibre candidates over the next few months in the run-up to the council election on March 15, 2008. Both Val Schier and Robert Pyne will be available at the entrance to Forest Gardens on Friday, 25 May, 2007 at 10:00am for a photo opportunity. (This is where the footpath leaving Forest Gardens stops abruptly and children have to walk along the cane lines). Why should we change the current Civic Leaders? Where are my Cairns City Council Divisions? Here are the general areas. You will need to veiw the maps at Council to see the exact boundary of your division, bevasue the Council website doesn't clearly show this! Also, please note that there are some boundary changes prior to the Election, and these are expected to be announced in the next 6 months. Who's announced that they're standing for Cairns City Council Elections? Want to Volunteer and help the Campaign to change our Council? Do you want to volunteer to help Val and the Cairns First Alliance this year? We are looking for help in all areas. Stay turned for the launch of Cairns First website. Val comes from a small village in the North East of Tasmania and first came to Cairns in 1982 after having worked in Western Australia and the Northern Territory. She moved to Machans Beach in 1984 and has worked in Cairns, Innisfail and Thursday Island over the past 19 years. She has one son who was educated at Machans Beach and Smithfield. Val has worked in both private industry and the public service and has run her own business. After many years in the workforce in positions of motel manager, teacher, breakfast cook and mining treatment plant operator, Val joined the public service where her achievements include: being Director of Business Development at Far North Queensland Institute of TAFE, leading the implementation of $2 million of employment programs for unemployed people in North Queensland and being a Regional Director in the Department of Families. 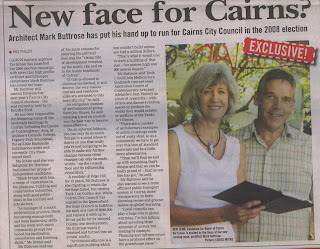 Why run for Mayor of Cairns? "My life experiences have given me skills in leadership, skills in planning and skills in delivering services to the community. I want to lead the City of Cairns in the direction that people want and in the way that people want. Most people really care about Cairns: they care about its character, they care about their lifestyle, they care about the beautiful, rich natural environment we live in. I know that I can make a difference by finding that balance between economic development, social development and the environment. And I think that people want a real choice for the future." This is the time to throw out the so-called "team" of [dis] Unity and make a change for the better. Val Schier is again putting herself and a great team of diverse locals forward to challenge the existing bunch who control of Council. If you want to get involved.. drop us an email today.